We are really proud, Volusha – News Reader got featured in TheSundayLeader and its sister paper Colombo Gazette. They have given a nice title to the article, “A new way of reading The Sunday Leader now on the Volusha app” and same for Colombo Gazette. Latest news from both `Sunday Leader` and `Colombo Gazette` news papers can be read in Volusha app. Amazing thing is, the readers of these news papers now can “listen” to the articles of their favorite news paper instead of reading it! Here are the link to the articles. 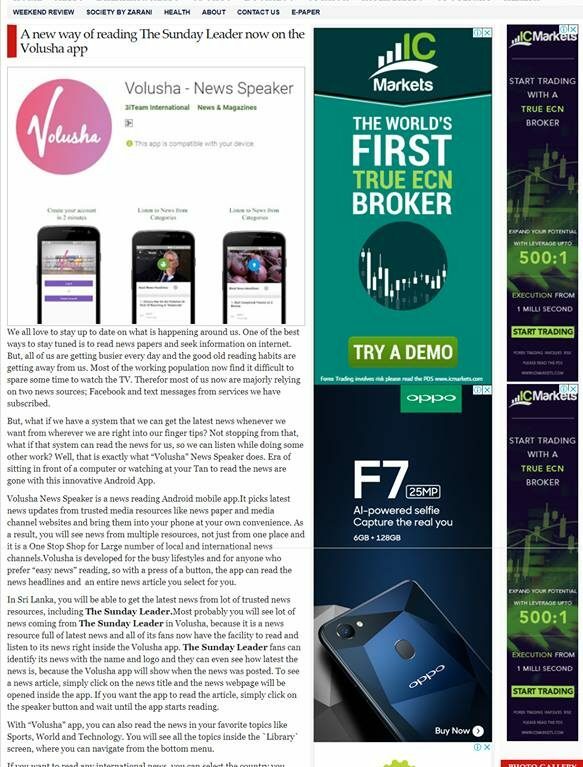 Thanks a lot for The Sunday Leader and Colombo Gazette for identifying the benefits of Volusha – News Reader for their user base!